Saints and Misfits by S.K. Ali — bonus book recommendation today! Bonus book today! I had intended to post about this book when I got to the letter S in my regular posts, but after I finished reading the book, I just couldn’t wait to share it with you. Selected Sentences: (I have chosen not to quote the opening sentences, but rather a couple of sentences from the end of the first chapter.) Mom had tried to put her foot down about taking a vacation right before exams… She didn’t know I had to get away from a monster. And the truth is no one can know. 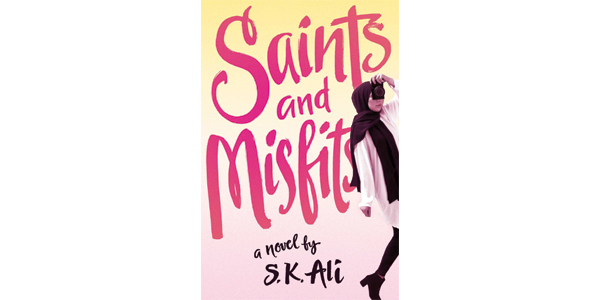 Synopsis: Janna, a teenage Muslim hijabi girl, divides people into “misfits” like her, “saints” like Sarah, a girl at her mosque who is bubbly, bouncy, and always organizing something for the youth of the mosque, and “real saints” like Mr. Ram, the aging man Janna accompanies to the community club every wee. There are also “monsters.” Janna has a horrible secret. A guy seen as a “saint” in their Muslim community, the cousin of one of her closest friends, assaulted her in the friend’s basement. Janna has another secret – she has a crush on a non-Muslim guy. This would not go over well in her close-knit community. Her faith is important to her, and she’s not sure how to handle it herself – especially when the guy she’s crushing on starts helping out in her girls-only gym class, and sees her without her hijab, which is forbidden. While dealing with this, and the fact that she sees the monster everywhere, looming over her, threatening her while continuing to be lauded as a saint by everyone else, she has to work out what is most important to her, and find the courage to act on that. Saints and Misfits is an excellent book. It deals with the serious topic of sexual assault in a way that is realistic but not graphic, and is ultimately empowering for girls. I learned a great deal about Islam, without the book being didactic at all. This book has heart – and it speaks to both the heart and the mind. I recommend it highly. Check out the author’s website, AND the fantastic list of links to articles and interviews about this book. Most importantly, read the book! Thanks for this recommendation. It is now on my TBR list. Excellent, Darlene! I hope you like it as much as I did! Wow. This book sounds very good. I’ll have to keep an eye out for it.